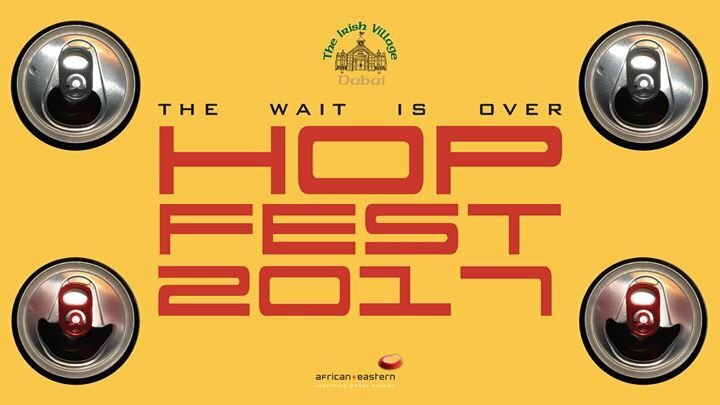 HOPFEST 2017 - The Wait Is Over! Hopfest 2017 will be held inside a gigantic marquee with air-conditioning, of course, and live music throughout! Get the most out of Hopfest 2017 by heading down early, where you will find discounts are available but for a limited time only. * THURSDAY 7th – 25% off when 10 vouchers are bought at 300 AED from 5PM to 7PM. From 7PM onwards 10 vouchers will cost 400 AED, so get down early! A minimum of 4 vouchers must be purchased on entry, costing 160 AED. Single vouchers can also be purchased for 45 AED each. * FRIDAY 8th – A minimum of 4 vouchers must be purchased on entry for 160 AED and a book of 10 vouchers will only set you back 400 AED. Again, single vouchers can be purchased for 45 AED each. * SATURDAY 9th – A minimum of 2 vouchers must be purchased on entry for 80 AED or again for those keen samplers 10 vouchers can be purchased for 400 AED. Free, you hear? Yes, free food will be available from 12PM to 2PM for everyone, this is a must not miss! Pub food will be available all day long.